The latest, and last, issue of MOME just came out this week, issue 22. What a run it was - it's an anthology which I'm very proud to have been a small part of. This issue is particularly good. I tried listing all my favorite artists in it but the list got way too long. You guys know who you are. Thanks X1000 to Eric Reynolds; it was so fun. It being the last issue made me finally get it together enough to finish something - the first proper comic I've finished in years (!). 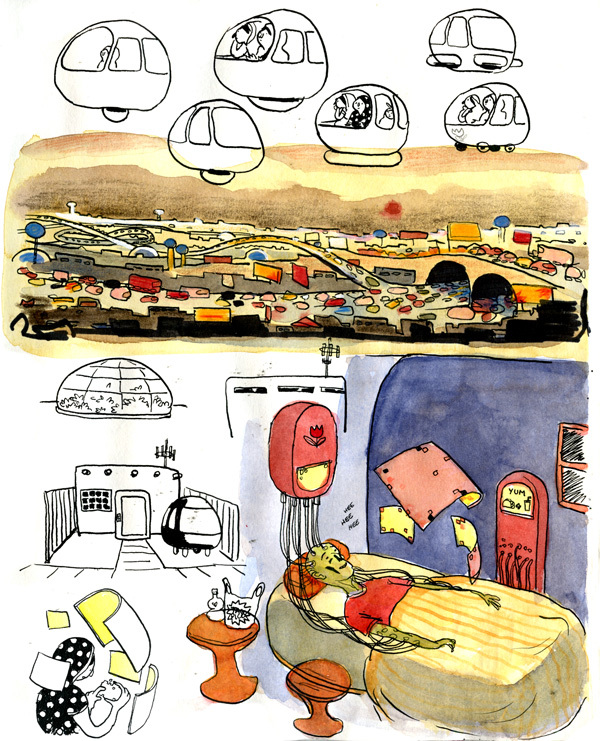 My story, Nita Goes Home, is 14 pages and in full color; you can see four preview pages here. 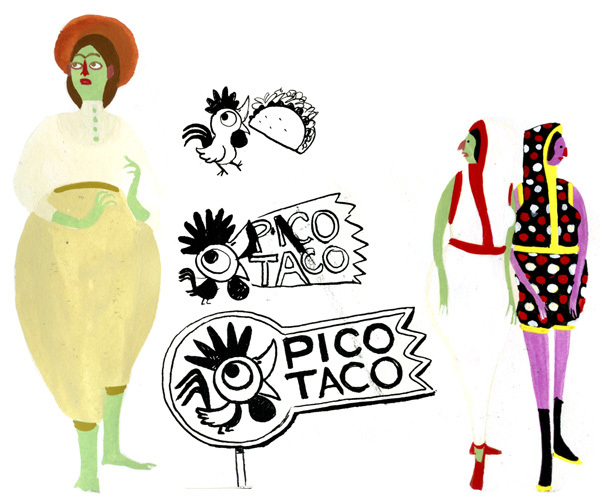 Here are some sketches - I spent an inordinate amount of time designing the logo for a only briefly mentioned taco stand, you'll notice. This story was intended to be kind of satirical (the main character Nita is basically a sillier version of me) but absolutely no one who's read it thinks it's funny, at all. Read it to find out just how not funny it is! Hey Eleanor, this looks fantastic. I just read the preview and look forward to getting the whole thing when I get back to the states sometime. I'm excited to see comics by you again! Did you know that here in China ther is actually a popular style of hoodie that zips up over the face like your toxoff suits (maybe they've hit the US now too)? They are not for pollution reasons, but just for fun. Some of the hoods have cool images on them so when you zip it up the two halves of the image come together over your face. I would love to see some of your art on one actually! Although, all the ones I've seen here are too small for my big western head. I thought it was very funny, but then I know the jokes you were making at your own expense. (Just last week I decided not to send you What I Eat because I know it will make you cry.) The story reeks of anticipatory guilt, but Daddy and I will not begrudge your idyllic life, especially if we are hooked up to machines that give us happy thoughts. I would also like to be hooked up to the Yum machine in your sketches, please.